What if your next house were to cost 1/10th of the average home while sporting a long list of high-tech hyper-ecological features? With the help of the Open Building Institute (OBI), which is designing affordable, ecological housing accessible to everyone - you may be able to do just that. In the good old days people built their own homes. My grandfather built his and lived in it with his family for decades. However, as homes and their sub-systems have become more complex along with ever more stringent building codes, few can claim to be able to replicate such a feat. OBI hopes to change that. 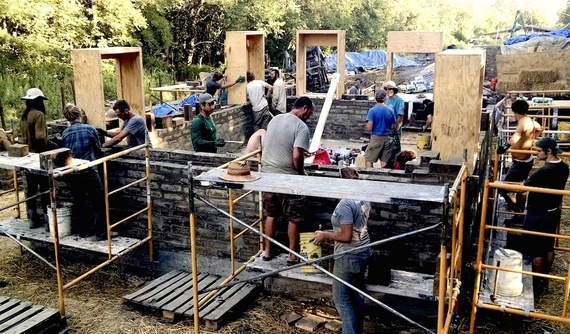 OBI is a new initiative that is creating a library of engineered modules and a series of rapid-build procedures to quite literally help anyone build an affordable home. The basic idea is if you can follow an instructable you should be able to follow a few of them - and if the modules are well organized and complete you could finish off a whole house with a few friends. OBI is following the same open source methodology that has made the Internet so successful --- sharing the source code with a free license. Google and Facebook and many other Internet companies use open source software on the backend because large scale collaboration generally leads to superior technology. Open source hardware follows the same approach from electronics to 3-D printers. There is a rapidly growing list of open source hardware projects, which are bringing millions of dollars of value to the world. Now OBI is adding 'house' to the list. In this case, rather than sharing computer code, OBI is sharing a toolkit that is open source and available free of charge--forever. The toolkit includes a library of modular designs (think of them like building blocks), detailed instructions, software, and even the open source machines (for construction and production of building materials following the Open Source Ecology model). 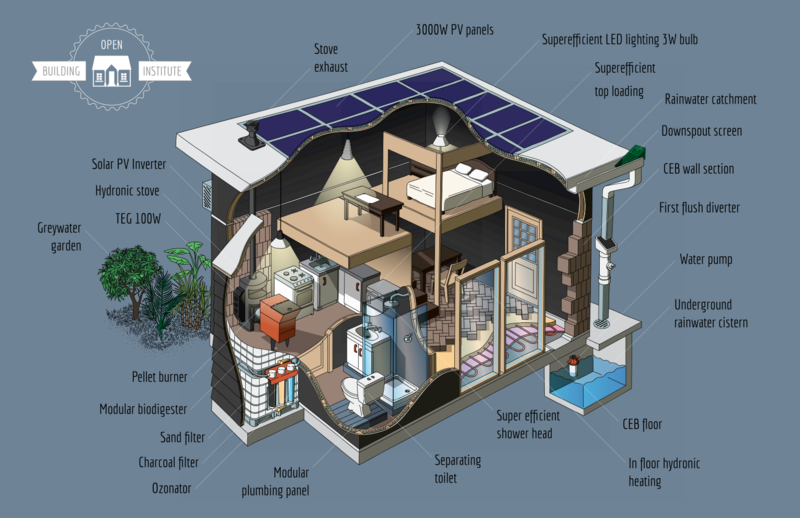 Users can design their own house using open source software, and can also contribute designs to the project. 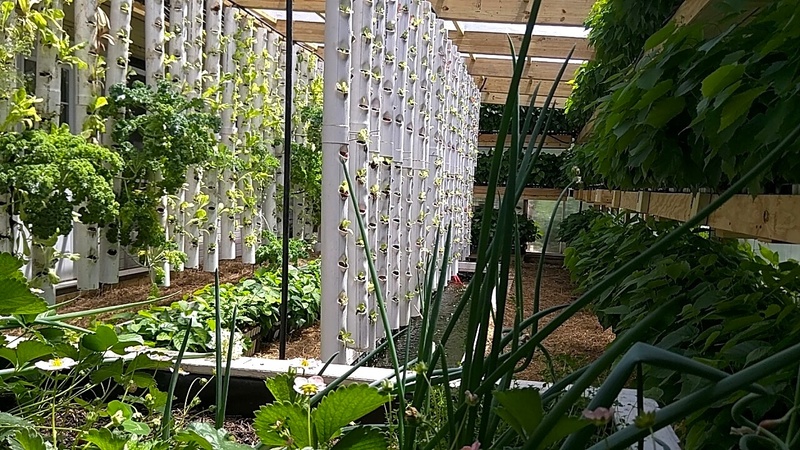 The preliminary designs are stacked with high-tech ecological features including a building integrated solar photovoltaic roof, in floor hydronic heating, and a biodigester. They aim to achieve Living Building Challenge certification in 2017, which is the highest standard for eco-construction. The standard OBI house model is off-grid (a recent study indicates this may be economic for many people in the U.S.) and will have an Aquaponic Greenhouse option, which produces all the fish and vegetables that a family can eat. OBI follows a rapid build approach where they can train non-specialists to put up the house in 5 days. If you have ever heard about an Amish barn raising you have the idea. They have already built a demonstration home - the plans of which anyone is free to copy. However, not everyone literally wants to build their own house. So the initiative plans to offer a turnkey build service to prospective homeowners in 2017 using an immersion training program for builders--to expand OBI build services to other locations (they are located in Missouri). They are using the now somewhat standardized Open Source Ecology Extreme Manufacturing workflow, which the organization developed over 12 previous builds at its Missouri headquarters. 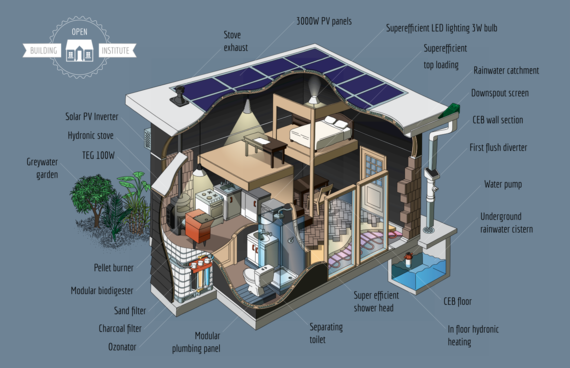 Are you interested in building your own green home?